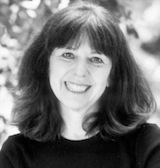 Linda Zisquit’s poetry collections include The Face in the Window (Sheep Meadow Press, 2004) and books of translations from Hebrew including Wild Light: Selected Poems of Yona Wallach (Sheep Meadow Press, 1997), for which she received an NEA Translation Fellowship. Her translation of These Mountains: Selected Poems of Rivka Miriam (Toby Press, 2010) was a finalist for the National Jewish Book Award. She lives in Jerusalem and teaches at Bar Ilan University.